Measure depths in tight spots and up to 22 deep with this Super versatile tool. 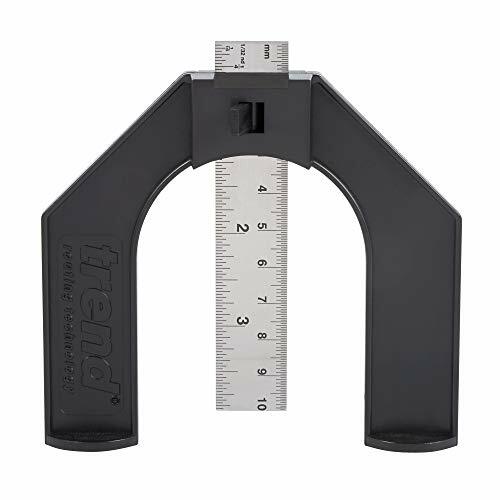 Precision measuring instrument used to determine the depth of any shape that has a step, groove, or slot. Features: range: 0 to 22" (with included 6 extension Rods 1", 2", 3", 4", 5", 6") resolution: 0.0005" Super high precision electronic indicator: 3 reading functions: inch, metric, & fractional power saving auto off feature extra large LCD display ABS: absolute & incremental reading resolution: .0005"/.01mm/1/128 inch accuracy: +/- 0.001" indicator gauge conforms to AGD standard and Federal accuracy specifications indicator can be mounted on center or side of base. Base Length: 4" includes 10 attachments (6 extension Rods and 4 feeler points) protective case included. Range: 0 to 22" (with included 6 extension Rods 1", 2", 3", 4", 5", 6") resolution: 0.0005"
The pin is removable as to measure the hole depths easily. This gauge will shut off automatically a few minutes later when you don't use it,so it will help you to save the battery life effectively. Instructions is added to provide the detailed information.Please read it before using. Adding Packing box so as to reserve it well. For the security, NO included the CR2032 battery,so customers need to buy the battery by yourself before using it. Measurement:Measure range from 0-80mm(0-3.125inch) Resolution:0.01mm/0.0005inch. A large LCD display designed to provide clear and quick readout for your measuring. Display reads in inches with millimeters. Design:Digital height gauge can be operated by repeat settings,so you can make backfence adjustment measurements.It can be self standing when working,it can also be attached on metal surface correctly with the help of the bottom of the magnet.Highly Convenient and Useful. Widely used:It can be applied to Horizontal & Vertical measuring for Hand Router & Router Tables & Table Saws & Saw Blade & DIY & Machine & Woodwoking etc with this device.Also can be used in measuring bore and slot depths with the auxiliary plunger. Three Modes -- Large Digital Display for quick reading, Easily change mm/inch/fraction, Relative and absolute values. Durable & Wide applicatoion-- Made of Tough Plastic, durable for Woodworking, Construction, Home Decoration, Table saws, Jand routers, Etc. Professional Precision 2 in 1 Digial Indicator & Depth Gage 2 measuring tools for the price of 1! This tool funtions as an indicator or as depth gage! Rod extends to 1", 2", 3" and 4" with the included extension bars to measure deeper. Features: Includes 1" and 2" interchangeable depth bars to extend the rod to 2", 3" or 4". 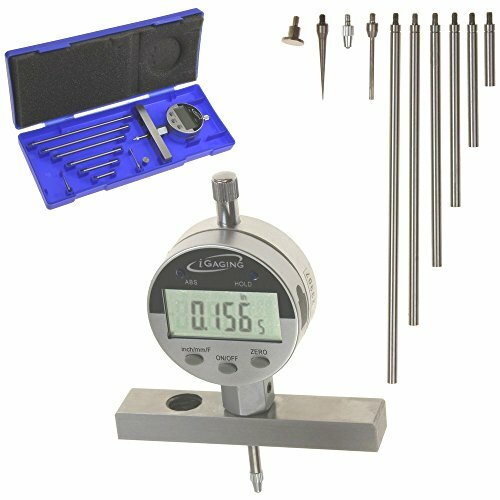 3-Reading functions: inch, metric, & fractional Spring loaded movement for easy use Use as an indicator or depth gage Large LCD display ABS: absolute & incremental reading Hold function 4-48 Thread interchangeable carbide tipped point Reading: 0.0005" / .01mm / 1/64 Indicator travel: 1" Measure range: 0 - 4" / 100mm Accuracy: 0.001"
Includes 1" and 2" interchangeable depth bars to extend the rod to 2", 3" or 4". 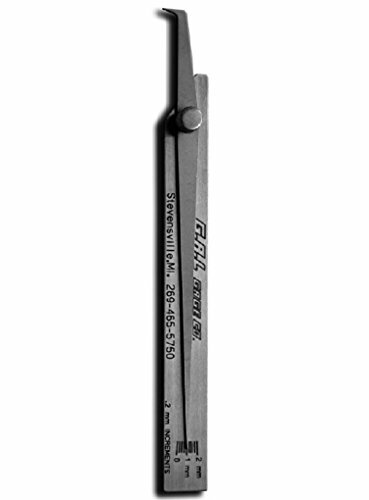 The Fowler 52-565-700-0 turns most 6" and 8" vernier calipers into a depth gage instantly. Easily attaches to the beam of your caliper with one screw. A 3" base allows sturdy depth measurements. Precision and hardened surfaces. This product has a 1 year warranty offered by Fowler High Precision. If you experience any problem contact Fowler directly for warranty claims. 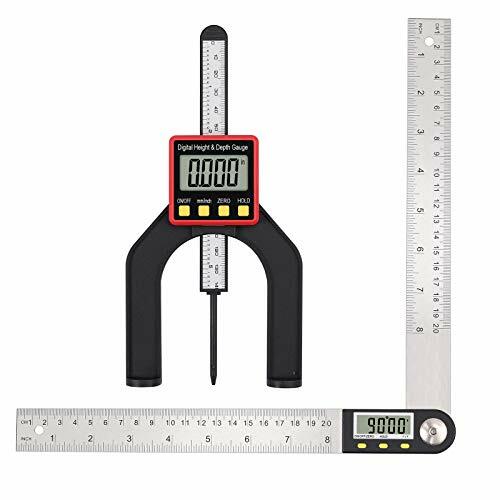 Fowler, an American company, manufactures inspection and measurement instruments such as electronic indicators, calipers, bore gages and digital scales. The company founded in 1946, is headquartered in Newton, MA. The Fowler 54-225-500 X-Tread tire gauge has a measurement range of 0 to 1" (0 to 25.4mm) with a resolution of 0.0005" (0.01mm), and is designed specifically to measure tire tread groove depth. The easy-to-read LCD screen displays in U.S./metric. The spring-loaded gauge has a hold-measurement button for ease-of-use and comes with a vinyl holster. This tire tread gauge is suitable for precise measurement in a variety of manufacturing and mechanical engineering applications. Depth gauges are precision measuring instruments used to determine the depth of any shape that has a step, groove, or slot. 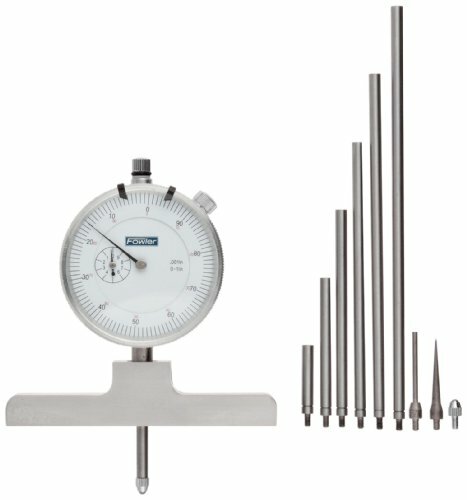 These gauges often take the form of sliders that travel on a measuring beam or rods, are moved to position by hand, and then adjusted with a calibrated screw. The base of the gauge rests at the top of the shape whose recession is to be measured, while the beam or rods extend to the bottom of the recession to determine the measurement. Gauge position is read from a graduated scale, dial, counters, or an electronic display. The Mitutoyo 129-127 depth micrometer has a measurement range of 0 to 4" and a resolution (or smallest graduation interval) of 0.001". 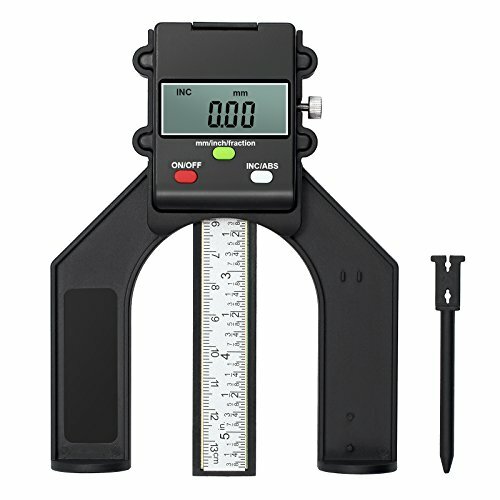 The vernier scale provides precise measurements, and it includes four interchangeable 0.157"diameter measuring rods for flexibility in measuring range. 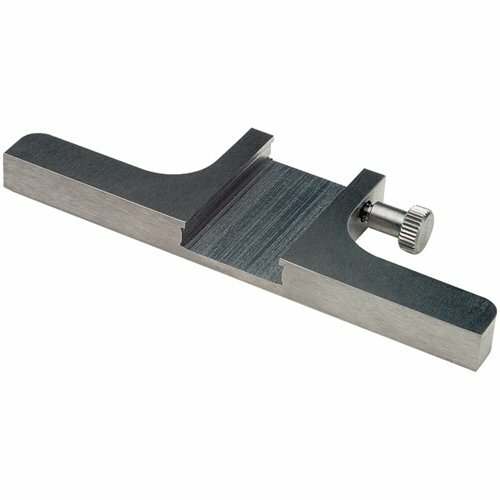 The gauge has a ratchet stop for uniform pressure and a measuring rod clamp for stability. It has a satin chrome finish on the body for readability and the base is made of hardened steel for durability and accuracy. It comes in a fitted plastic case. This depth micrometer is suitable for precise measurement in a variety of manufacturing, machining, and mechanical engineering applications. 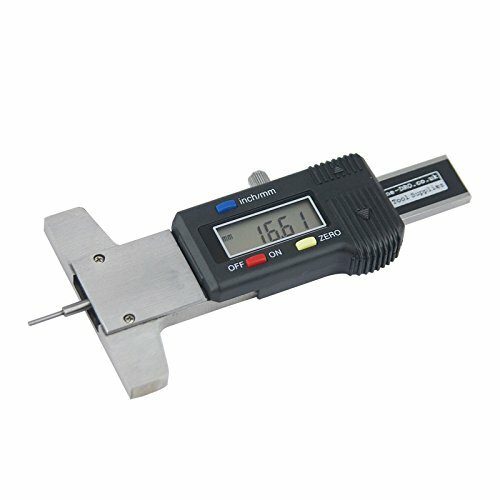 Measurement range of 0 to 4", and resolution of 0.001"
Range: 0 to 22" (with included 6 extension rods 1", 2", 3", 4", 5", 6") Resolution: 0.001"
Indicator can be mounted on center or side of base. Base is 4 long. The Fowler 54-125-777 Electronic Depth Gauge gage has a measurement range of 0 to 22", and a resolution (or smallest graduation interval) of 0.0005", with +/- .001 /.03mm accuracy. The LCD screen displays in U.S./metric. This depth gauge includes six rods that connect together for the 22" range and two extra points for small holes, one 0.078 inch diameter x 1" long and one needle point x 1" long. The gauge has an On/Off button and a zero reset that can be used at any position. The base is 4" long and has been ground, hardened, and lapped for durability and accurate measurements. The gauges conform to Federal Accuracy specifications. The shipping weight of the gauge is 0.9 lb. and it comes with a hardened plastic case. Depth gauges are typically used in manufacturing, machining, and mechanical engineering. . This product has 1 year warranty offered by Fowler High Precision. If you experience any problem contact Fowler directly for warranty claims. 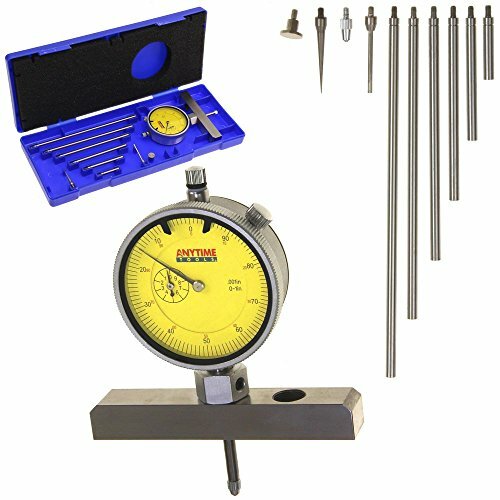 Anytime Tools 2" - 6" ELECTRONIC DIGITAL PRECISION ENGINE CYLINDER HOLE BORE GAUGE GAGE - RESOLUTION 0.00005"
The Brown & Sharpe TESA 0560013 depth measuring foot has a 6mm x 75mm measuring face and is suitable for use with Brown & Sharpe or Etalon surface calipers (sold separately) with a measuring span of up to 6" (150mm). 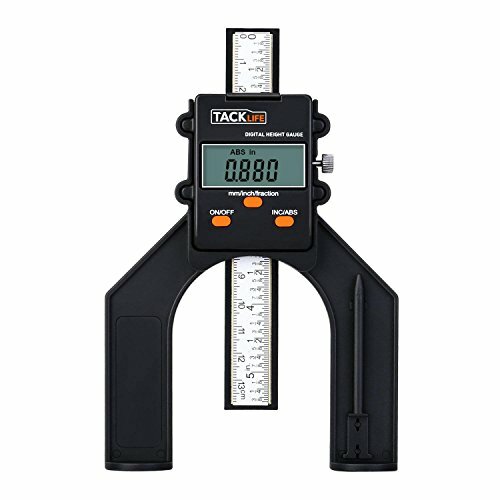 The measuring face is ground for flatness and a locking screw holds the gauge securely. The foot is made of hardened stainless steel for durability and accurate measurements. This depth measuring foot is suitable for precise measurement in a variety of manufacturing, machining, and mechanical engineering applications. 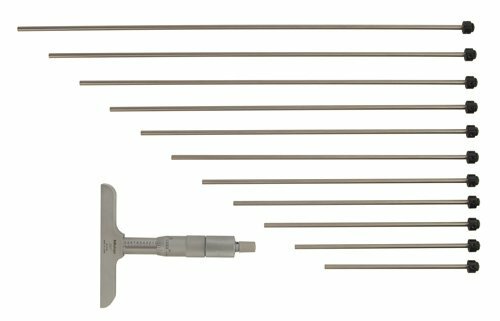 The Mitutoyo 050084-10 depth base attachment has a 4" base length and is suitable for use with Mitutoyo 4 to 8" (100 to 200mm) vernier and dial calipers (sold separately). The knurled locking clamp holds a caliper securely. The base is made of steel and the measuring face is ground for flatness. This depth base is suitable for precise measurement in a variety of manufacturing, machining, and mechanical engineering applications. The clear and easy to read display can be set to zero in any position, metric or imperial display and auto shut off. The G.A.L. Gauge Co. 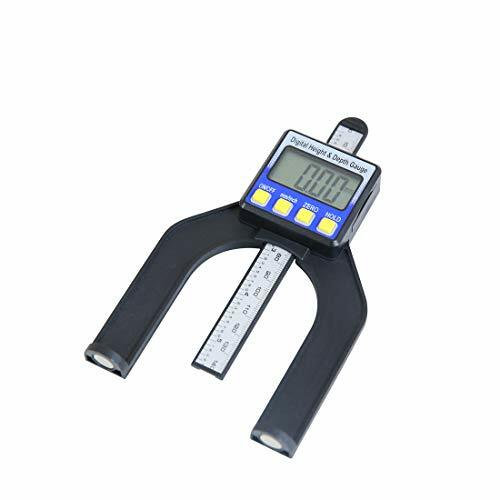 Pit Gauge Stainless Steel GAL-5f, Metric Measurement Scale is an easy to use instrument. Brand: G.A.L. Gauge Co. | Manufacturer: G.A.L. Gauge Co. 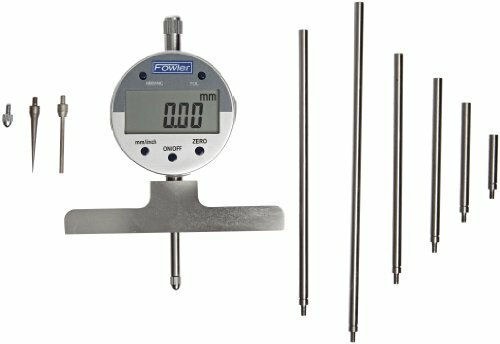 The Fowler 52-125-006-1 Steel X-Series Depth Gauge with 4 steel base has a measurement range of 0 to 22", and a resolution (or smallest graduation interval) of 0.001", with + or 0.001" of accuracy. The dial provides precise and easily readable measurements. This depth gauge includes six rods that connect together for the 22" range and two extra points for small holes, one 0.078" diameter x 1" long and one needle point x 1" long. The dial gauge has a satin chrome finish. The unit has a base 4" long steel base. The gauge conforms to the American Gage Design (AGD) standard and Federal Accuracy specifications. The shipping weight of this gauge is 0.9 lb. and it comes with a hardened plastic case. 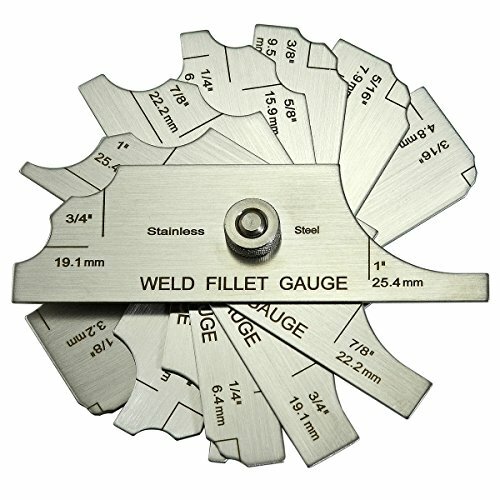 Depth gauges are typically used in manufacturing, machining, and mechanical engineering. This product has a 1 year warranty offered by Fowler High Precision. If you experience any problem contact Fowler directly for warranty claims. Depth gauges are precision measuring instruments used to determine the depth of a shape that has a step, groove, or slot. 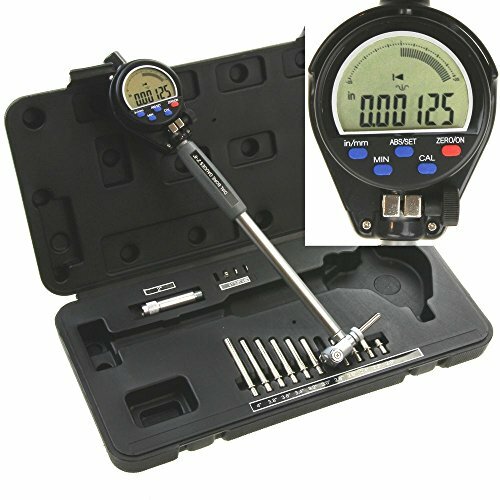 These gauges often take the form of sliders that travel on a measuring beam or rods, are moved to position by hand, and then adjusted with a calibrated screw. The base of the gauge rests at the top of the shape whose recession is to be measured, while the beam or rods extend to the bottom of the recession to determine the measurement. Gauge position is read from a graduated scale, dial, counters, or an electronic display.